In the first part, the business risk buster strikes at a car showroom where two co-owners cannot agree on anything and the only way out is their business divorce. How to divide a company among shareholders so that it doesn't hurt you. Learn from mistakes made by other entrepreneurs. In the first part, the business risk buster strikes at a car showroom where two co-owners cannot agree on anything and the only way out is their business divorce. Contents: Avoid co-ownership of a company in equal shares. If you cannot own a company by yourself, conclude a partnership agreement. Beware of employing family members. Continually adjust the number of employees according to the amount of your profit. Regularly assess the effectiveness of all your employees. How to easily perform a financial analysis of your company. In the second part, which takes place at a well-known seaside resort, you will learn how the business risk buster helped a local jeweler get his company out of a crisis. Contents: Remember that good years in business alternate with worse ones and sometimes really bad ones. Try to avoid senseless spending in your business. Watch out that you don't get tricked by cheaters or even your (former) friends. Thoroughly consider every decision you take and consult an expert if necessary. The third part is quite dramatic. The business risk buster tries to reconcile his client with the late fifty-percent share owner's very aggressive widow. Contents: If you co-own your business with a partner, agree in advance on how things should go if something bad happens to one of you take relevant measures to prevent an ideal business partnership from becoming a big problem that is hard to solve. If there is a problem, try to find an amicable solution first. 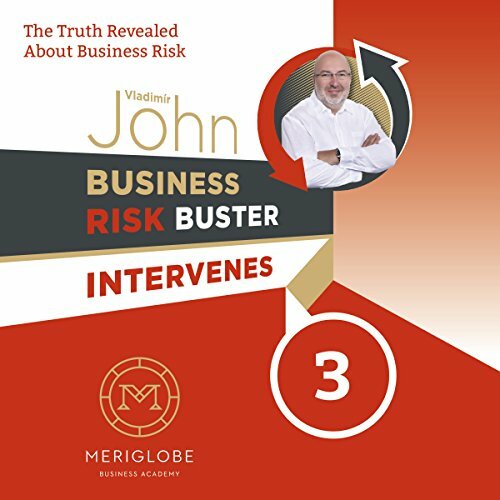 In the fourth part, the business risk buster strikes at a building materials shop. An unfaithful wife and the following divorce almost brought a well-established company down. And the consequences could have been much worse. Contents: Be careful that your business doesn't ruin your family relationships. Keep in mind that business is often linked with a risk of criminal punishment. Every business can be insured, all you need to do is to find the right insurance company. In the fifth part, the Business Risk Buster strikes at a gun shop. A seventy-year-old gentleman decided to sell his company and shop, but he forgot about his collateral in the bank and almost ended up paying very dearly for that. Contents: Don't be afraid to start your own business, even at an advanced age: you have enough life experience and a cool head. Before you sell your company, prepare thoroughly for such a transaction. Always choose the buyer very carefully. When selling a company, make sure you are not held liable for its obligations. In the sixth part, the business risk buster strikes at a medical clinic. A wealthy developer bought his wife a clinic, but she left him and the clinic soon afterwards. So he hired a managing director under whose management it went from bad to worse. Contents: How to analyse your company from the inside. How to get rid of an incompetent manager. How to hire a more capable manager. How to choose the right investor. Learn from mistakes made by other entrepreneurs. In the seventh part, the business risk buster strikes at a deli. The new owner took it over from her husband whose business success drove him to a mental hospital. Contents: Don't let success and money turn you into somebody else. No matter what happens in your business, don't succumb to it and face the new situation. Don't let fraudsters deprive you of your honestly earned money and assets. How to easily build up a holding that will reliably protect you from business risks and pitfalls. Learn from mistakes made by other entrepreneurs. The ninth part takes place in a restaurant, leased by a recently divorced businesswoman who wanted to forget about the divorce of her husband and father of their two adult children. However, what she failed to realise was that she did not have the slightest understanding of the restaurant business and actually didn't enjoy it at all. Contents: Don't let your emotions rule your common sense. Do business only in fields that you enjoy. Watch out for people who try to make you believe they care for you, while only caring for your property. The tenth part takes place again in a hotel, only due to the fact that it deals with a businessman who has lost his company. Ironically, the one to rob him of it was his less successful competitor. Fortunately, he did not give up and, despite further adversities, managed to get back up again on his own two feet. Contents: Make sure that quick business success does not deprive you of your vigilance. Don't forget to protect your intellectual property. Put all agreements in writing, even if concluded with your best friend.